When you are singing in the studio, you desperately need to move out of logical, critical, analytical left-brain mode. Why? Messages go deeper when understood emotionally instead of just analytically. Left brain singing is not as compelling as right brain singing. Think about it... which moves you more -- to hear a formulaic, even, predictable, logical voice with perfectly even rhythmic pattern or an unpredictable, slightly de-constructed voice with conversational rhythmic pattern? 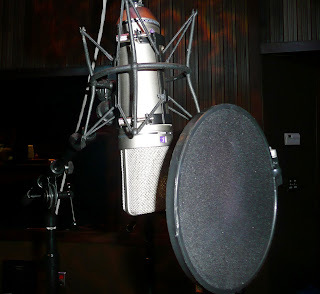 You will tend to demand over-tuning and editing of your vocals, not realizing that less is very often more when it comes to mechanically perfecting vocals. By trusting your vocal technique, setting yourself up properly so you can feel more than think as you sing. By being able to trust the feedback you're getting from your production team. This lets you enter your creative child mode and get the critic out of the vocal booth. Have you ever gotten stuck in your left brain in the vocal booth? What did you end up doing about it? Andrew... I think the best remedy is to replace the technical thoughts with communicative intentions. Who are you talking to when you sing in the presence of a large audience? Best to make it ONE person... whether it be a soul who needs the message, God, a friend/family/loved one or a fictitious amalgam person, just try your best to get the message to that one person and there isn't much room in your head left for technical perfectionist thoughts. I find it helpful to remember it's not about being perfect, it's about being powerful in making a difference for someone. Hope these thoughts help... thanks so much for your comment!